Update July 12 - Don't forget this Friday is another "Free Friday" coupon! Originally posted June 19 - There's a new Free Friday coupon out! 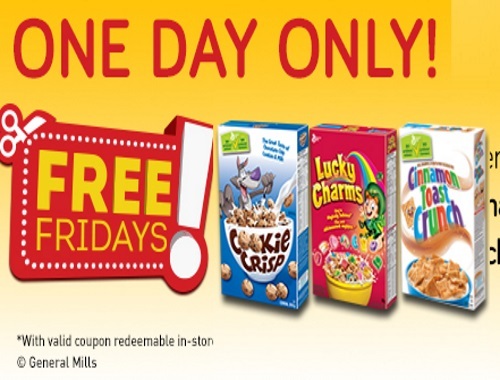 Get a Free Cookie Crisp cereal 318g with the purchase of one Lucky Charms cereal (any size) or Cinnamon Toast Crunch cereal (any size). This coupon is redeemable only on one day, Friday, July 14, 2017. Order your coupon at the link below, while quantities last. This is a mail coupon. Also, click here to request a second set of this coupon!